Tendril: Echo Received is a 2D platformer where you are an evil demonic-like creature called Dragon. Crawl on walls, through ventilation shafts, frighten civilians, hunt them down, modify their minds and bodies and get rid of those who are foolish enough to oppose you! Play with your prey and release your master from its eternal slumber! This looks fun! I love that you play as the monster for a change, and I like it's design. Also I find the title strangely enchanting for some reason. Plus Art Deco + Cyberpunk sounds fresh! Looks really nice! I love the pixel art! Hey everyone, I am the graphic artist for Tendril: Echo Received. Recently I have been working very hard on animations of NPCs (NPC = prey = cattle ). I have revisited some older animations and made some new ones. So here are some improved ones first. Although the old version is ok, it did not capture the emotion of fear and panic as I wanted. The new one does the job much better. She opens her mouth in fear and her arms are ready to push anything from her path. She leans forward which moves her center of gravity in the direction of movement. I have also added more secondary animations. Here I have added more secondary animations on her torso and her hair. Now they support the overall action much better. Today I would like to show you how we are dealing with Artificial intelligence in Tendril: Echo Received. All behavior is defined using behavior trees. This special type of tree defines actions as nodes and each node may be executed in multiple AI ticks. We define, that NPC should move between points on its patrol path. On each point, it must wait for 2-2.5 sec. If it spots the player, it must wait for a short time before losing all its wits and start panicking. Apart from NPC AI, we are also considering to use it for more complex animations. 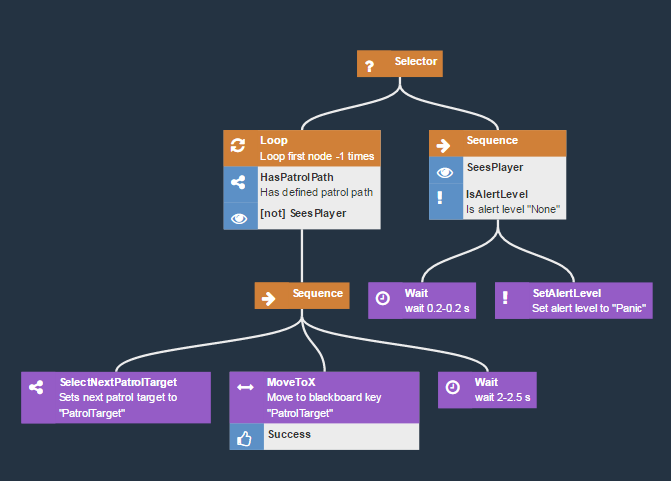 Good news are, that we have today released our behavior tree editor as open-source. So you can check it out here. lately we have spent a lot of time tuning up Dragon’s control. You don’t want to think about how to surprise your prey – you just want to do it, don’t you? Now we are exited to show you few interesting examples how the game will help you not to think... well at least about controls. During our countless tests we noticed that it is natural to push the stick in the direction we will want to move just before we actually can. How strange is that? Below you can see how Dragon automatically moves up and crosses corner when you push the stick to the right before reaching the corner. Wall jumps are awesome especially when all you need to do is to press jump. When you want to be really fast you can jump over a corner – cool isn’t it? Or just push the stick to the right and Dragon will do most of dirty work for you. Dragon will automatically cross corner and move away from it when he ends up where he does not feel comfortable. Really cool concept! 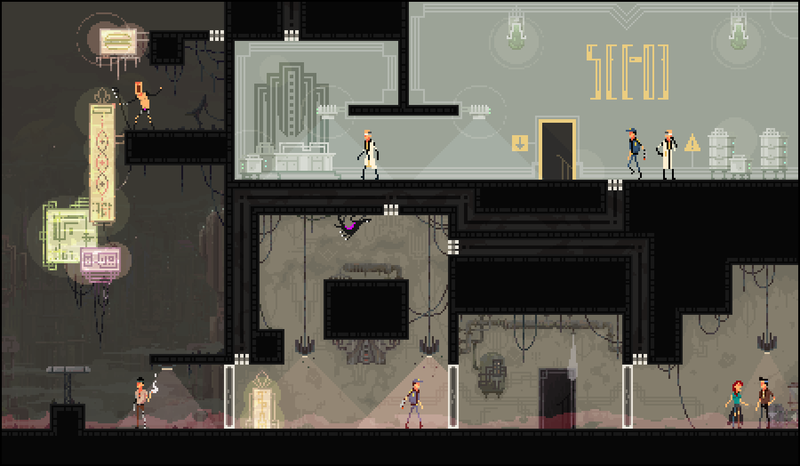 I love how it subverts games like Alien: Isolation and in 2D, too! How do you plan on having the NPCs fight back? Are they going to come at you with a shotgun if there's one lying nearby? Or will they take a less direct approach and lay down traps for you? Are NPCs even going to fight or will there be some other sort of failure state to add tension? Hi, Thanks! We are planing to have multiple classes of NPCs. There will also be security forces and they will fight back. Civilians will probably be only capable of raising alarm. Their main purpose will be to become source of cheap building material and also to be terrified . We want to give player sense of power to some extent. There will also be cultists. We want them to be some sort of crazy people that will try to help you in your vile quest. Usually they will not run from you - at least until you kill some of them and even then, some of them will embrace changes that Dragon will cast upon them. Also we are planning to have security devices like cameras, automated sentry guns and such. Thanks! Exactly! We loved to play as Alien in AVP series, but we always felt, that they have not utilized the full potential of Alien as such. For instance in the last AVP game, you were able to place facehugger on civilians, but it had no real effect. In Tendril we want to give player more control over fate of your victims – not just kill them and be done with it. Do you know the game Zombie Night Terror? If not then you might find some inspiration there. This looks really good your characters have a lot of style to them (I like how badly the cool guy with the cigs and the robo-hand freaks out) and the fluid controls look to work really well. One thing, it kind of throws my eye off how when you wall jump up to the ceiling, Dragon flips around to have his legs down. It would look really good (but of course, be extra coding/art...) if he did a backflip kind of jump and gracefully landed with only a 90 degree rotation in total. Thanks for sharing some of your code, too. How long have you been working on this? Also thanks for your tip. That`s a good idea, we will absolutely look into it. We are also planing to tune up all Dragon`s animations to be more fluid and to look more natural while crawling upside down. Cool idea! I want to see where you go with this for sure! Check out Spider for super intuitive running along walls controls. I only played the original on iOS, but there is a sequel that is on Steam that probably controls similarly. Also thanks for mentioning Spider! We bought it and analyzed its controls. It is indeed very fluid and intuitive - perfect for a mobile game like Spider. Yet we believe it would not fit Tendril so much. It is too autonomous. Spider does everything for you. When playing it, we did not feel that we were actually in control because it was like Spider sad 'hey, let me do the controls, you just watch'. What we want is to let the player have fun just from simple moving around. We were designing and tuning the controls on empty levels without interactive stuff and we wanted this simple moving around to be as fun as possible. To achieve this the player has to be in control and he/she must deal with variations in terrain to some extent. But everything must still be 100% fluid and intuitive. There is a very thin line between having good intuitive and fluid controls and having too autonomous controls. In short time we want to let you guys try our controls in the playtesting forum. 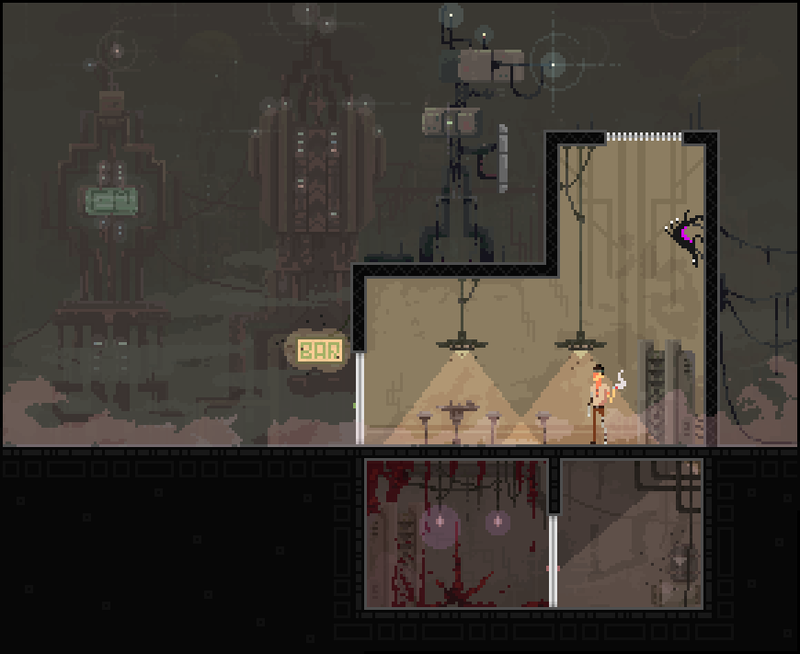 Slightly reminds me of Paradise Lost: First Contact because of the theme and pixel style. But in your game you (i.e. the main character) definitely has more power and you are move menacing! Is that as close to the top of the ceiling as dragon can go? I'm just wondering because what if you'd like to drop off the wall? If that case moving up+right might be better to move dragon to the ceiling. Or maybe I'm just thinking of the game that I have in mind. Or maybe I'm thinking of games where you'd push the up button/direction and the character auto climbs to the ledge (e.g. on a ladder). However, on the other hand, that approach probably wouldn't work too well in the case when you are moving down on a wall and want to move left or right but not drop off. So, your idea of using left or right direction, might work better if both type of surfaces can be travelled. But it also depends on overall gameplay. Oh, would those "mini walls" have some purpose in your game - e.g. hiding? Could you expand on that? I have a feeling that is sort of an auto move by the computer. If it is, then have a good feeling that I'd find it quite annoying. Civilians will probably be only capable of raising alarm. Their main purpose will be to become source of cheap building material and also to be terrified Smiley. We want to give player sense of power to some extent. I was also thinking about having NPCs with similarish AI. Some would be "brave" enough to fight, others "curl up" when faced with danger. However, being pushed in a corner might make some braver ... or could go "crazy/berserk" as a last attempt since they have nothing to lose. If you want a "campaign" mode where a certain NPC always reacts predictably, then behavior values could be preset. Otherwise, setting them up randomly could allow for a rouge-like random unpredictable gameplay. You can move freely up, down, left and right. That means you actually can go up to the corner and when you reach the ceiling, Dragon will automatically transition to the ceiling. In the gif above we wanted to show that when you are close enough to the ceiling, instead of pushing up button / stick, you can push right/left instead and Dragon will go up automatically. You can still push up instead of right/left but in our tests we noticed that in some cases it is natural to stop pushing up when close enough to the ceiling and start pushing right/left before the corner is reached. So we decided to support both cases for as natural feel as possible. You will be able to hide behind any wall - all depends on positioning of NPC, devices and their vision. When jumping to a wall (e.g. ceiling) half of the Dragon`s body could end up floating in the air while the other half would stand on a wall. This would be weird and it would not feel good. This is exactly what we fix. It is not something that would happen too often but we just did not want something like that to happen at all. The fix is executed really fast and the player should not notice it during play. Additionally the player can always interrupt it by pushing button/stick to any other desired direction. We are still experimenting with behaviors and emotions of NPCs, but we do not want something too much random. We want the player to feel being in control, but there are almost always cases when some randomness could be beneficial. But as I have said we are exploring all possibilities in this matter. Just to let you know, we are currently spending most of our time working on guards! today we would like to show you how we are handling sound propagation for AI purposes in Tendril: Echo Received. Each NPC is activated by sound when it is directly accessible. 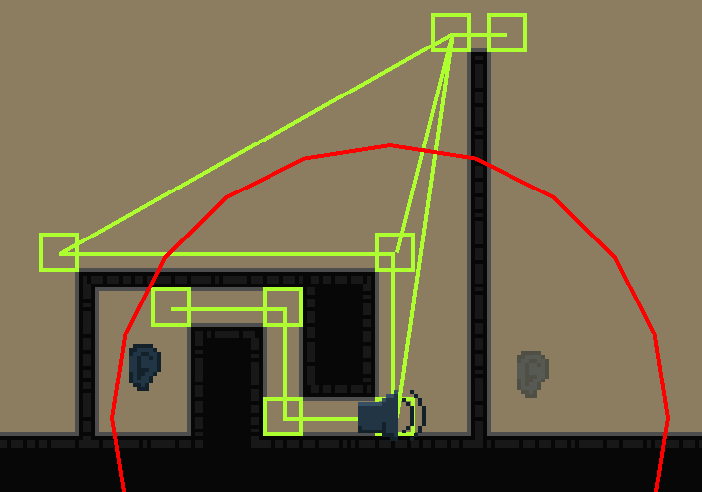 For cases, when we need to propagate sound around corners, we are using a sort of path-finding. We will use this type of propagation for local sounds as hissing of Dragon, or making other sounds to lure unsuspecting enemies to embrace their undoing. For more global sounds, like gun fire, we will use predefined rectangular areas that will ignore all obstacles. This will allow us to carefully define separated areas of interest.